Our team makes us great. We are always accepting resumes from qualified professionals. Our ideal employees have a clear understanding of the highest level of customer services, professionalism and quality service. With a friendly and positive attitude is how we deliver the best health and wellness services right here in Indianapolis. Please be sure to email your cover letter & resume if you'd like to work with us! As part of our mission to make wellness convenient, we take our services right to our client's office, conventions and home parties. We offer chair massage and full-body massage on-location. To be considered for this part-time position, you must be licensed with the state of Indiana. Our business, leisure and celebrity clientele require the highest level of professionalism, effective service and positive attitude. You must be licensed with the state of Indiana to be considered for this part-time position. 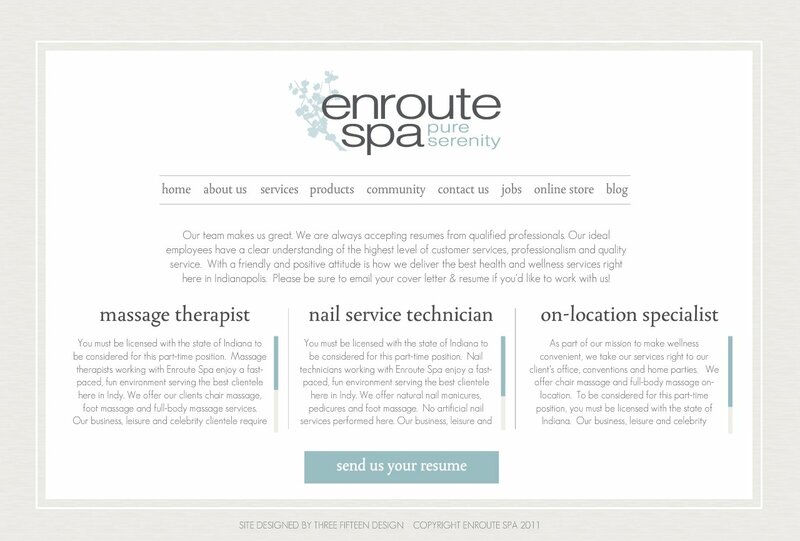 Nail technicians working with Enroute Spa enjoy a fast-paced, fun environment serving the best clientele here in Indy. We offer natural nail manicures, pedicures and foot massage. No artificial nail services performed here. Our business, leisure and celebrity clientele require the highest level of professionalism, pampering and effective hand and foot care. Our clients appreciate your positive attitude. You must be licensed with the state of Indiana to be considered for this part-time position. Massage therapists working with Enroute Spa enjoy a fast-paced, fun environment serving the best clientele here in Indy. We offer our clients chair massage, foot massage and full-body massage services. Our business, leisure and celebrity clientele require the highest level of professionalism, effective massage therapy service, and appreciate a positive attitude. Massage therapists can work with us at our airport locations, our corporate partner offices, conventions and special events, spa parties and in-home appointments.